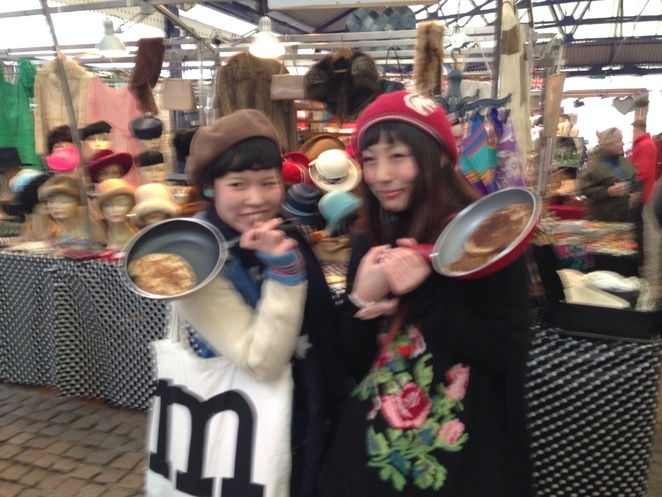 The Japanese pancake flipping team after their victory for cultural understanding. The fastest pancake in the west was flipped by two girls from the east, with two Japanese girls running in the Shrove Tuesday pancake race at Greenwich Market. When asked their impressions, one replied, "Interesting, really local. We don't have this type of culture in Japan." When asked whether they heard of it, she said, "I saw it on YouTube." Her friend told Weekend Notes, "We only just heard yesterday." Since Shrove Tuesday was the last day of frivolity and feasting before Lent. When asked whether Japan had anything culturally similar, they replied, "We don't really have a day like that." 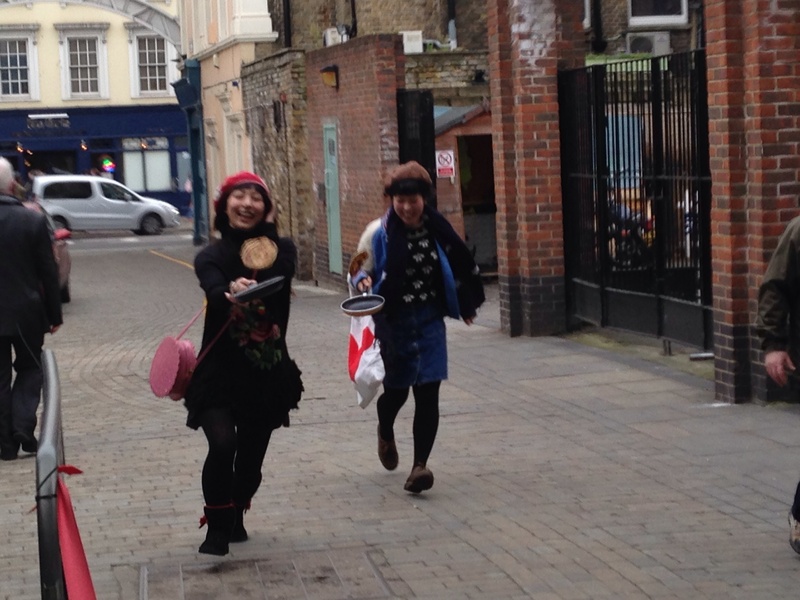 Since a pancake race is quintessentially English, what did she make of this snapshot of English culture? "It's interesting. It's different, we don't do these kind of fun things in Japan. We were curious to see what's happening." Their curiosity got the better of them when they were put into a relay race consisting of four teams. Each had to toss a pre-cooked pancake and run to the end of the lane that connects the main road and back again. The winner was the team of four that came first, many of whom were improvised on the spot. From what I could see, they really enjoyed themselves and did quite well. The Japanese national pancake tossing team really learned about the eccentricities of English culture from its traditions first hand. When asked about its origins, Greenwich Market's PR spokeswoman stated,"We started last year and we thought it would be quite fun to do it this year and raise some money for MacMillan, so it's very light hearted." When asked how this English tradition originated, she drew a blank. "I don't know that. We'll have to look that up on Google. It's imbued in the British tradition, it's all to do with Lent. You got rid of all your fat and butter before Lent and then you can starve yourself. How the races started, I'm not sure." Since this is a blank that has to be filled, I'll fill it: it all started in 1445 when one woman was late for a shriving service at church in Olney, Berkshire, so she had to carry her frying pan when she heard the church bells. The race commemorates this nameless woman's dash for church, which is in a great cause. "We support MacMillan at Greenwich Market quite a lot," she pointed out, "such as the Big Coffee Morning, which happens in September. We do quite a lot." The most quintessentially English at its most inclusive. The turnout was considerable for a Tuesday afternoon and comprised of market traders, staff, tourists and people from Mencap, which shows how inclusive these events can be. Paul, a service user with Hammersmith & Fulham Mencap, gave his impressions of the event; "Good fun." What did he enjoy about it? 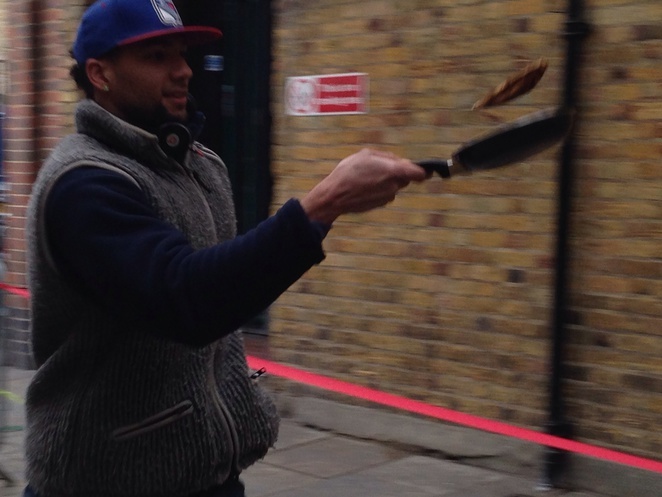 "Tossing pancakes." However, the participant who travelled the furthest for the quintessentially English rite were the Japanese girls.